Well friends, since I have mentioned this book so many times in my book tags over the past few weeks, I decided to finally post a review for you guys. Yay motivation! I Am Legend is not a huge book, based on length alone, but the weight and gravitas of this story goes beyond any measure. It is a haunting story that has been one of my favorites since high school. I recommend it to anyone who is looking for something creepy or just something that doesn’t seem to be that well known, but is truly amazing. I mean, everyone knows Stephen King, but do they know that he had this to say? “I think the author that influenced me the most as a writer was Richard Matheson. 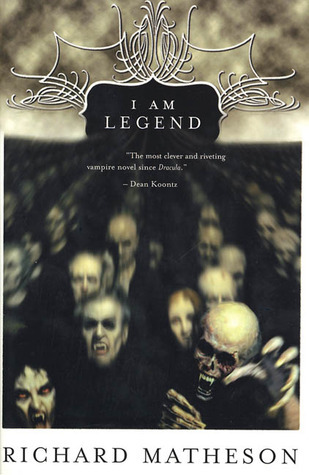 Books like I Am Legend were an inspiration to me.” And really, in King’s best novels that I have read, he emulates the subtle, creeping sense of dread that Matheson writes so well. This book is not just for fans of the horror genre, but anyone wishing to delve into the mind of the last living man on earth, as his world is slowly taken over by vampires. What really struck me about I Am Legend, when I first read it, was how accurate a depiction it seemed to give of a man consumed by loneliness. More so than any vampire attack, the protagonist Robert Neville’s desperate inner thoughts left me feeling frightened and disturbed. Neville is an interesting character to follow, because he is not altogether good or bad. You all know how I love morally grey characters! He is a man that is struggling to hold on to morality and ethics in a world where they don’t seem to belong anymore. I mean, think about it for a moment; if you were truly the last person alive on earth (as far as you knew), what would you let yourself do? This was a study too of human nature and how someone might behave when they knew no one was around to judge them, condemn them, or stop them. Now this all seems a lot deeper than your run of the mill horror story and that is what is so great about it! There are no cheap jump scares here, folks, and that is what makes it all the more creepy. When Matheson wrote this book in the 50’s, the “zombie apocalypse” trend wasn’t yet a thing. So although his monsters resemble zombies a little more than vampires, he calls them vampires and tries to put a new twist on what the audience knew about them up to that point. Really before this, the biggest vampire comparison they could make was Dracula. Matheson went even further with the idea and brought in a worldwide viral epidemic that turned humans into the undead. He used science and Neville’s observations to give an explanation for this virus, too, which I loved the idea of. So really, this book was basically the trailblazer of the zombie era that we all know today. That’s legit! In the book, Neville spends his time observing the dead and running experiments to try and figure out their condition. He barricades himself in his home at night while the vampires roam the streets and hunts for them during the day when they are lying dormant, hiding from the sun. It is during this time, about three years pass over the course of the book, where we see Neville begin to unravel. His sanity is understandably wearing away as more and more time passes with him alone in a world of monsters. The writing is stark, oftentimes wandering with a stream of consciousness, and surprisingly poignant at times. I would not have guessed that a horror book could be so insightful, so moving, and nostalgic until I read this one. Again, I can see where Stephen King gets it. Matheson took a scary book about vampires and not only turned it into an insight on a lonely man’s struggle, but on an existential study of humanity in general. On what it means to be human, to be good, and to be a community. That is why, when we meet the two other living characters in the novel, they mean so much to the plot. That is also why I will never forgive the Will Smith movie for butchering this story as much as they did, but more on that in a moment. When Neville finds the stray dog outside his home, it is one of the final symbols of hope that he has. He is overcome with the need to protect this dog, because it is literally the only other living creature he has seen in years! And so, when he finally gains the dog’s trust and brings it into his home, where it then dies, the impact that death has on Neville is astronomical. It is akin to his last bit of humanity and hope dying with that dog. Neville is once again, truly alone. He begins to take pleasure in killing the vampires and seeks solace in alcohol because he has no sense of self preservation any more. He has lost all hope for any other outcome and goes through his life knowing his fate is sealed. It is only a matter of time. So, when the character of Ruth comes in, Neville reacts with suspicion and anger. He cannot trust that there is another living soul on earth with him. Their interactions are both harsh and comforting. Then, through Ruth, it is revealed that the vampires have evolved, that they are not all mindless killers and they can survive in this world with their disease. This is the sharpest plot twist of the novel: Neville, the only human left alive, has become the heartless monster. He has been killing these creatures in their sleep, like legends of old-time vampires always warned about. Knowing this, Neville succumbs to his fate when he is captured and taken to the headquarters of the new society where he is to be executed for his crimes. This part is so chilling to me, when Neville looks out over the crowd of sentient vampire creatures and acknowledges that he is the least human among them now. And that is why his final words of the book still give me chills when I think about them. I am legend. Ah! It is so good! That ending has stuck with me for all of the years since I have read the book. The twist that Matheson puts on his horror tale is akin to something out of the Twilight Zone, making it so much more frightening than monsters simply running around mindlessly and killing. Human nature is always a far more haunting tale to me. And let me just briefly touch on the I Am Legend movie. Since I will be forever salty about it! In the movie, the dog’s death is brushed aside as something the vampires did to cause Will Smith to hate them more. It does not hold nearly the emotional impact that it should like it does in the books. In the movie, the vampires are more like super fast zombies that have no higher order or culture at the end of the movie. In the movie, Ruth is a human that Will Smith sacrifices himself to save. She does not betray him, she is not a vampire, and she makes it safety in the end and finds a whole refugee camp of living humans!! What the eff? That completely ruins the concept of the story! And, obviously, those bone-chilling final words are never even uttered. Totally ruined. They took a truly creepy, nuanced, well-crafted, emotional story and turned it into a mediocre action movie that’s about as shallow as the soy sauce dish at a sushi restaurant. My friend and I were so angry when we left the theater. But, luckily, there are people that agreed with us, people who have experienced the story for what it is and appreciate it’s true depth. So please, please, if all you know about this story is the Will Smith version, do yourself a favor and read Matheson’s original. You might be filled with nihilistic gloom and sleep with a nightlight for a few days, but it will be beyond worth it.